Techland had a little fun at Bungie's expense yesterday, after the Destiny developer rolled out a promotional partnership with Red Bull that offered exclusive DLC to players who purchased, and presumably drank, specially marked cans of the stuff. We didn't bring it up here because Destiny isn't on PC, but Dying Light is, so when Techland launched its "Real King of Hydration" campaign, we figured it was worth a mention. 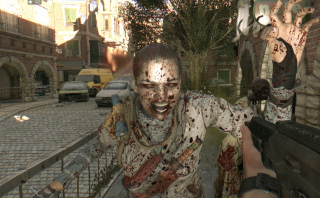 It was mostly a gag, albeit one with a payoff: Dying Light players who tweeted a picture of themselves drinking a glass of water at the official Dying Light Twitter account with the "DrinkRightDyingLight" hashtag would be given a code for a premium weapon docket. But the response was such that Techland decided to take it further, with a full-on Drink For DLC campaign. The same rules apply—post a picture of yourself chugging some fine H2O—but the hashtag is now "DrinkForDLC," and there are multiple stretch goals, beginning with a 50 percent XP boost to player agility for 24 hours on June 28 (which was just hit) and running through four separate pieces of new DLC that will be released free when the various tiers are hit. Techland hasn't said anything about the nature of the DLC, quite possibly because it hasn't decided yet—remember, this is all happening more or less on the fly—but it has confirmed that pictures of pets drinking water will count toward the final total, as will photos tweeted yesterday with the original hashtag. It's silly, but it's fun, and smart, too; poking fun at an unironically-silly promo campaign while simultaneously handing out free stuff is a great way to build up goodwill among your fan base. Speaking of which, Techland has also delivered the weapon docket, as promised, on the DrinkForDLC image below: TH1RST-1S-R34L. Redeem it at dockets.dyinglightgame.com.